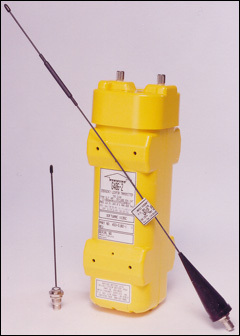 The Artex G406-4 transmits on all 3 emergency frequencies (121.5/243.0 and 406.025 MHz). The system was designed for use with the general aviation market in mind. The ELT automatically activates during a crash and transmits the standard swept tone on 121.5 and 243.0 MHz. The G406-4 also transmits a 406.025 MHz encoded digital message to the COSPAS/SARSAT satellite system, which allows for rapid identification and reduces search and rescue response time. The G406-4 has been tested to meet the rigorous requirements of TSO C126 including 500 G shock, 1000 pound crush as well as flame and vibration tests. The G406-4 is available for use with Artex's low cost whip antennas or a sturdy fiberglass rod antenna. The G406-4 also may be interfaced with the Artex ELT/NAV Interface which enables latitude and longitude data to be transmitted as part of the 406.025 MHz message.